Ceiling cleaning in Orange County can substantially prolong the life of a kitchen ceiling. Cleaning eliminates stale odors and gives your kitchen a brighter and more professional look over night. Grease, cooking oils, and powders stick to ceilings. Daily exposure to these chemicals creates a buildup that darkens a ceiling. Over time the buildup causes tiles to sag and smell. Employee morale and pride in their production will decrease as their work area deteriorates. Buildup left on tiles damages a ceiling to the point that tile replacement is required. Health Departments will site restaurants with sagging ceilings since openings develop that allow vermin to enter a kitchen or hazardous situations for employees. Ceiling cleaning for a restaurant in Orange County is performed when the restaurant is closed. To protect kitchen equipment and supplies, the Cleaning Crews will tarp anything that cannot be moved. Once the tarp has been placed, our Crews apply a degreaser chemical to the ceiling. After the degreaser has loosened the buildup power washing begins. Vinyl tiles are power washed to remove grease, oils, and stains. The power washing force does not damage tiles. The water washes away the buildup for a dramatic improvement. Tile appearance improves 70-80%. Next tiles and t-bar are wiped to remove excess water. Protruding lights are hand cleaned. Light panels, usually 2 ft X 4ft, are taken down to clean both sides. Vents are sprayed then hand wiped. After the ceiling is cleaned, tarping is removed and floors are squeegeed dry.It will be approximately two to three hours until the ceiling is fully dry. When tiles are permanently damaged due to repeated exposure to steam or perforations that allow vermin to crawl into kitchens, it is time for them to be replaced. Usually kitchens have a few tiles that are repeatedly damaged due to ovens, steamers, and other hat intensive equipment. Our Crew will install new tiles. Tiles can be cut to fit around corners, signs, etc. 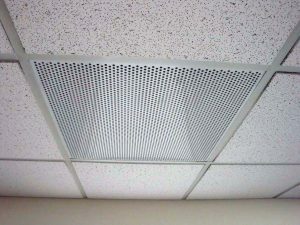 Damaged or rusted vents (diffusers and returns) need to be replaced. Our Crews install new vinyl returns and diffusers. These vinyl vents are easy to clean and do not rust. Installation can be done quickly and at a reasonable cost. 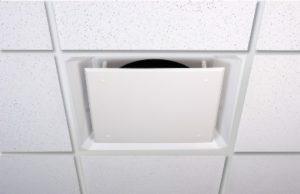 Air returns have a new look, facilitate air returning to above the ceiling, and can easily be cleaned. If the old look is preferred, it can still be in vinyl material which does not rust and cleans. Also available for use as a diffuser or return is a combination unit. This provides a uniform look across the ceiling. For those diffusers that are blowing on food or people, an easy fix is available. 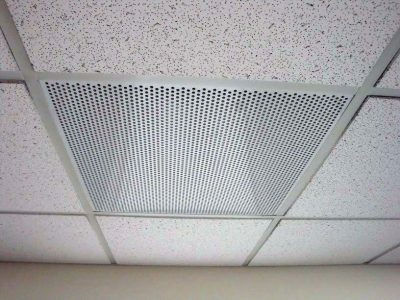 Whether it is rectangular or triangular, the diverter allows the full amount of air to flow into a room but it directs the air away from sensitive areas. Metal t-bars are frequently damaged or lost when maintenance work is done on air conditioning units or roofs. Missing t-bars should be replaced to ensure tiles are supported properly. 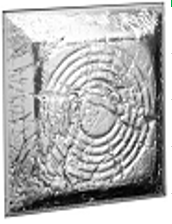 Stained or rusted t-bars can be covered with vinyl grid cover. 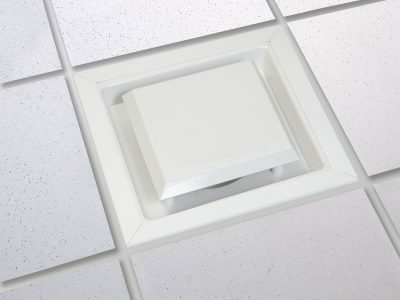 The grid cover helps protect the metal t-bar and it gives a ceiling a new look overnight. No permits required. Heavy wires, air conditioning repairs, or time can cause a ceiling to sag. Ceiling Ease Crews can level that ceiling. Cables coming through ceilings can have protective material around them to minimize daily damage to the ceiling. Let a kitchen look its best to promote team pride in your employees. Heat, rolling out from ovens daily, scorches tiles. Rather than continually replace vinyl tiles, install stainless steel tiles. Protect the ceiling and have a professional look.